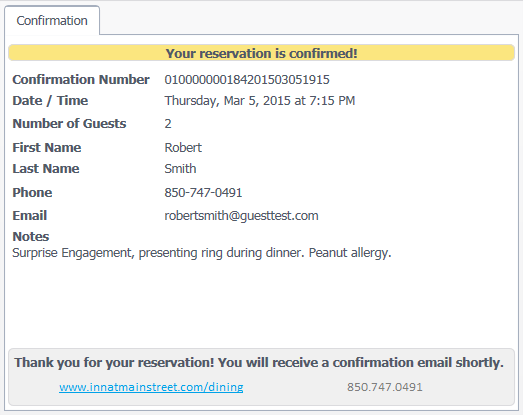 Execu/Touch Dining Reservations allows you to reserve restaurant seatings for both hotel and outside dinner guests. Its link to Guest Profile enables you to enter and save guest information and preferences and also to view dining dates from the profile screen. Setup begins in POS Administrator with Table Setup. Once you have set up your tables, go to Dinner Reservations in your Execu/Touch Food & Beverage menu. Go to Setup > Application Setup. The "Resv. Management Settings" window will open. "Company" This field auto populates with the current company. You cannot change this field. "Shift Start" Enter the beginning time for the first service. Use a 24-hour clock such as 15.30 for 3:30 pm. "Shift End" Enter the time of completion of the last service. Use a 24-hour clock such as 01.00 for 1:00 am. "Grid Time in Minutes" Enter the number of minutes to display increments of time. 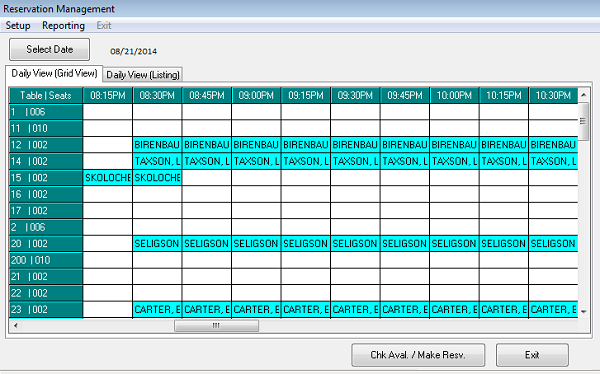 For example if you want your grid columns to show 5:00 pm, 5:15 pm, 5:30 pm, etc., then type 15 in this field. 30 would display 5:00, 5:30, 6:00, etc. "Reservation Time" Enter the time in minutes for each reservation's seating. If you allow 90 minutes per seating, enter that time in this field. "Special - Daily Price" If you have daily pricing such as $75 Tuesday through Thursday and $110 Friday through Sunday, you may enter those amounts in this grid. Enter 75 for $75.00. "Stat. Cut Time" This field is not used. Next, go to Setup > Seating Time Setup. The Table Seating Management window will open. Click "Import Day". This will import your table information into the day's grid. This is the table information that you set up in Table Setup in POS Administrator. Each table is listed in order of table number in the "Table#" column, as shown above. The number of seats at each table is listed in the "Covers" column, as shown above. The remaining columns represent your seatings. You will edit these columns. For example, Seat1 is the first seating; Seat2 is the second and so on. The time format will be 1700 for 5:00 pm and so on. All of the squares in the grid do not have to be filled in. Tables having squares with no time entered for specific seatings will be unavailable for reservations. 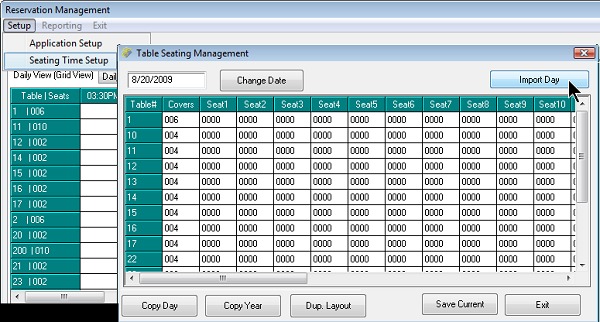 Below is a populated Table Seating Management grid. Notice that Table 1 is available in thirty-minute increments beginning at 5:30 and lasting until the final seating at 9:30 pm. Table 10 is available in two-hour increments beginning at 5:30pm and lasting until the final seating at 11:30 pm. Table 19 is unavailable for reservations. Remember to click Save Current when you are finished. You can duplicate this day's layout to another day by clicking "Dup. Layout". A calendar will display allowing you to select the date to copy. 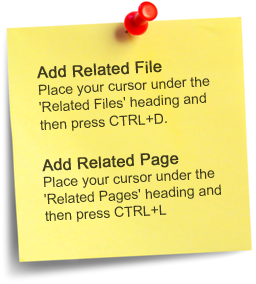 You can copy this day to the same weekday for the next 52 weeks by clicking "Copy Day". To enter another day's seatings, click "Change Date" and selecting the date from a calendar. If your seatings are the same for every weekday, you can click "Copy Year" to copy this day to the next 365 days. After you make a lodging reservation, a popup will ask "Make Dinner Reservations". Answer Yes. 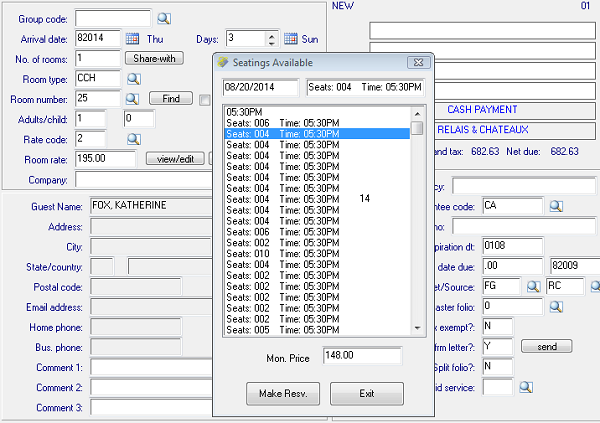 The available seatings will display so that you can select a table type (number of seats for each table) and time. 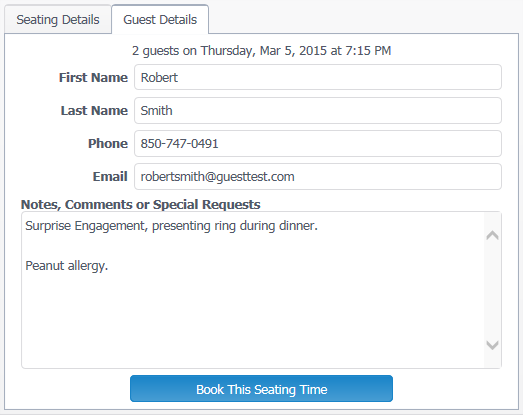 Note that you are selecting a table type and not a specific table number. Click "Make Resv." to continue. You also can make a new reservation by going to "Food and Beverage/Retail" on your Execu/Suite menu and selecting Dinner Reservations. 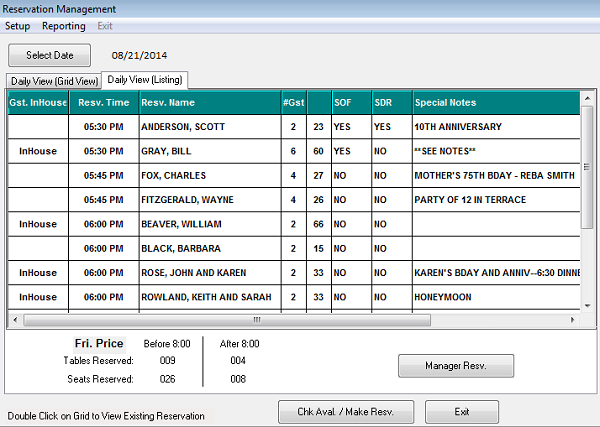 For stand-alone POS workstations you can go to Dinner Reservations on the Execu/Touch menu. "Add/Change Reservation" screen will open. Enter the number of guests in the "# of Guests" field. You may select a table number at this time by entering the table number in the "Selection" field. You may do this later if you prefer. Click "Lookup" to select a guest from existing profiles. If you access this screen by answering "yes" to "Make dinner reservation" when completing a reservation, the guest profile will be selected for you. If this is or will be an in-house guest on the date of service, click "Guest in house". You may add notes in the Notes area. You also may add event notes such as "Anniversary" in the "Sp. Event/Resv. Note" field. To create a Special Order Form (SOF) click "View/Edit SOF". 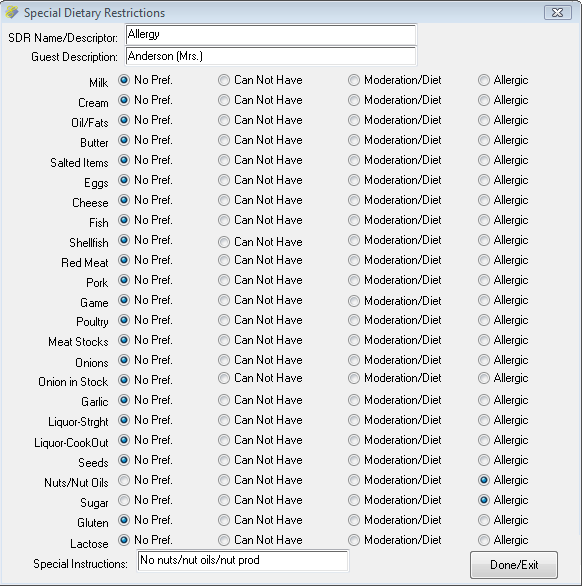 To enter Special Dietary Restrictions (SDR) click "View/Edit SDR". These are shown below. These are not required but are easy-to-use tools if you want to utilize them. 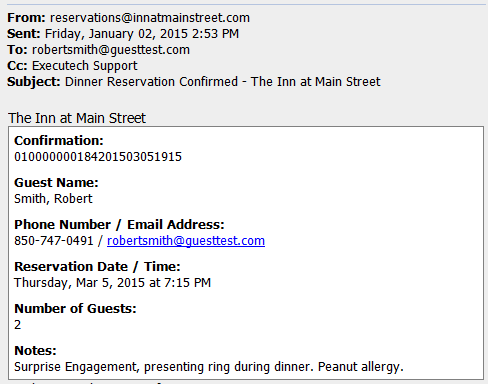 When you have completed the dinner reservation, a popup will ask if you wish to email a confirmation. If an email address is attached to the guest's profile and if your email settings have been configured, you can send an email confirmation at this time. To make dinner reservations on the fly, select "Dinner Reservations" from your Execu/Tech menu and then click "Manager Resv". Below is a brief overview of what the guest will see on your website is you are using WebRes for dinner reservations. 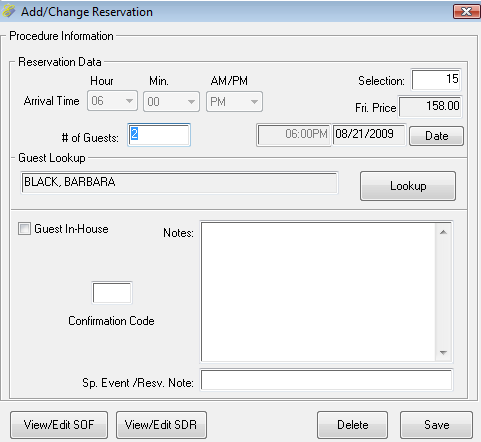 The guest will select the number of guests from a drop-down and then select the desired date. 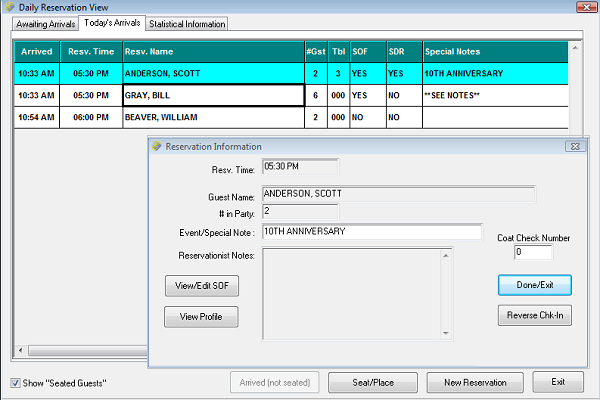 Available seatings for that date will display and the guest will select the desired seating from those shown. 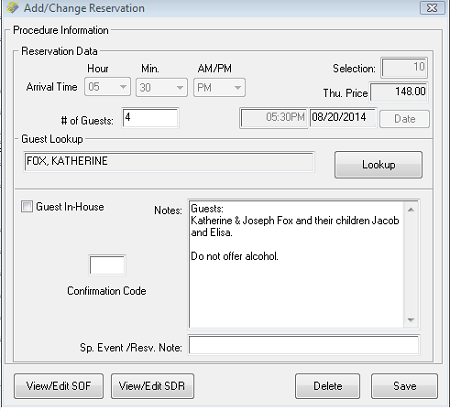 When the guest clicks "Enter Your Personal Information" the Guest Details screen will open, allowing the guest to enter the requested information along with any notes, comments, or special requests. 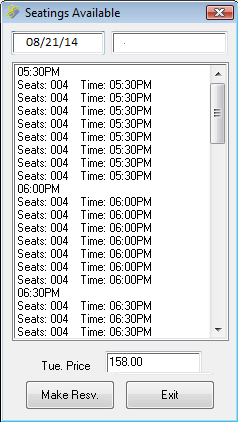 When the guest clicks "Book This Seating Time" a confirmation displays, as shown below. The guest will receive an email confirmation. A cc email is sent to the designated recipient at your property. 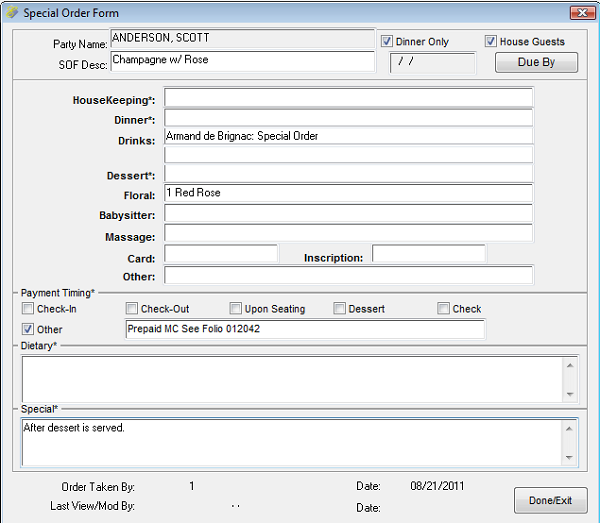 On-line Dinner Reservations requires a separate purchase for the WebRes interface. Whether the reservation was made on-line or in-house you can make changes easily. From your Execu/Tech menu select "Dinner Reservations". "Reservation Management" will open. Click "Select Date" to view reservations for that date. Click the "Daily View/Listing tab for the list of reservations. Double-click the reservation you wish to change. The guest's reservation will open in the "Add/Change Reservation" window. Make the changes, such as assigning a table number, adding notes, SDR, etc. To change the seating time, you have to select a date first, even if it's the same date. To view the chart showing available tables and booked tables, select Dinner Reservations from your menu and then select the date to view. Click the "Daily View (Grid View)" tab. To make a reservation from this screen click "Chk Avail/Make Resv". 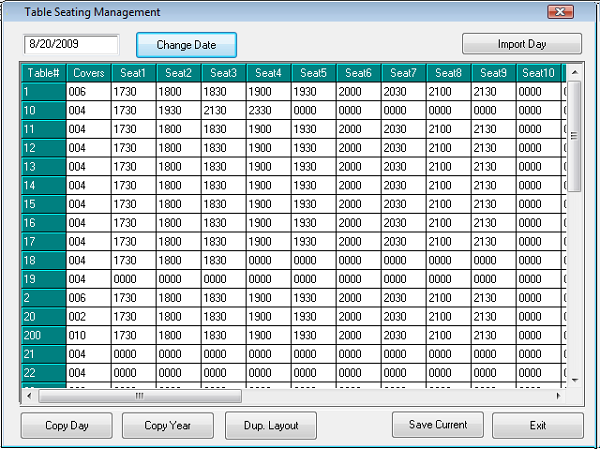 The "Seatings Available" will display showing the table types (number of seats) and times. Click "Make Resv" to make a new reservation. See Making Dining Reservations In-House. 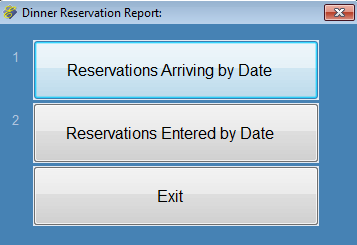 From the Table Selection screen, click "Reservations" as shown below. 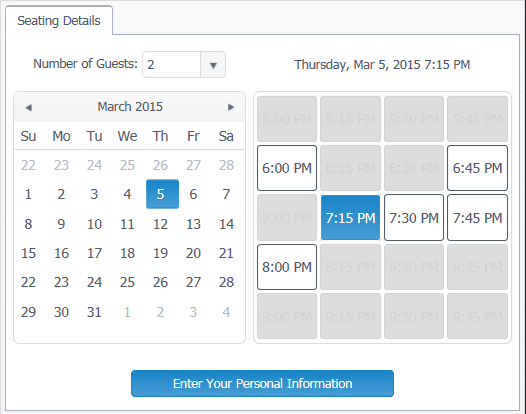 The "Daily Reservation View" window will open showing today's reservations. Click the "Awaiting Arrivals" tab. 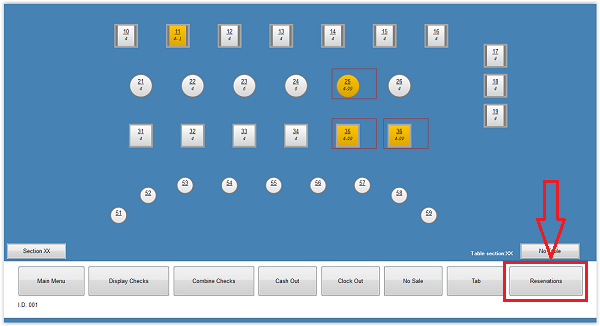 Select the guest to seat and then click either "Arrived (not seated)" or "Seat/Place". To seat a waiting guest, click the "Today's Arrivals" on the Daily Reservation View screen. Select the guest then click "Seat/Place". Double-click the guest to view the reservation information. 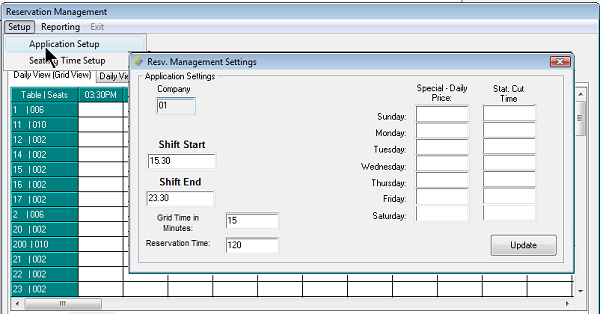 From the Reservation Management select Reporting to view or print daily reservations. 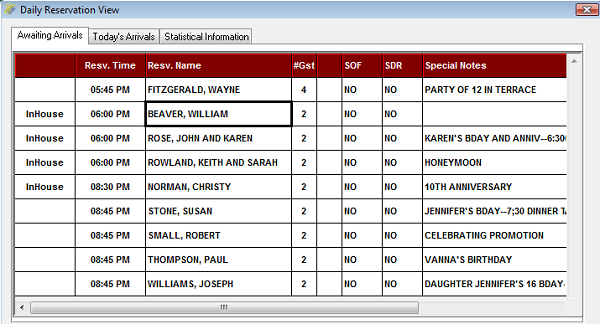 This report shows arrival times for each party, table number or table type (number of seats), special notes or comments, contact phone number, and whether there is an SDR or SOF for the guests. The bottom of the report shows the number of tables and seats reserved.